While the question of "why?" 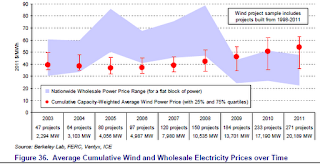 is not answered, or asked, the EERE report estimates the costs of the wind expansion. 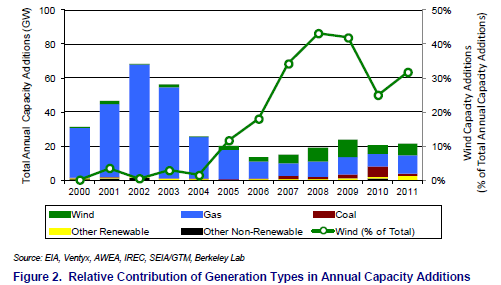 From my Ontario perspective, it's notable the growth in US capacity has been in wind and gas over the past 7 years, just as it has been in Ontario. The added wind output is acquired at about half the price of Ontario's FIT program forces Ontarian's to pay. The EERE report does not show Ontario's gas procurement over that time also appears to be 50-100% more costly that the build-out in the US. Regional Variations in Capacity Factor Reflect the Strength of the Wind Resource. Based on a sub-sample of wind power projects built from 2004 through 2010, capacity-weighted average capacity factors were the highest in the Heartland (37%) and Mountain (36%) regions in 2011, and lowest in the East (25%) and in New England (28%). Not surprisingly, these regional rankings are roughly consistent with the relative quality of the wind resource in each region. 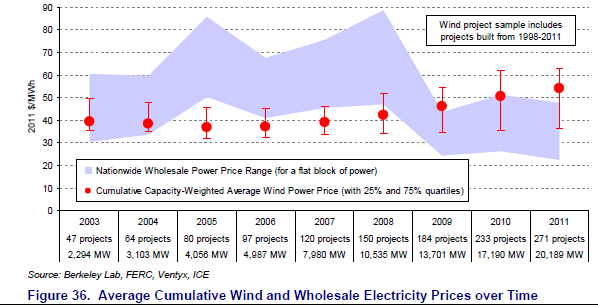 the cumulative sample of projects built from 1998 through 2011 had grown to 271 projects totaling 20,189 MW, with an average price of $54/MWh (with 50% of individual project prices falling between $36/MWh and $63/MWh). worldwide survey of grid operators that together currently manage over 141 GW of wind (Jones 2011). Some utilities are now directly charging wind power projects for balancing services.81 BPA, for example, includes a wind energy balancing charge in its transmission tariff equivalent to about $5.40/MWh. strategies and decision support systems for integrating variable energy resources in control cnetres for reliable grid operations (Jones 2011) .